The markets crashed and spending tightened, but the perilous circumstances didn’t dissuade Erin Paruszewski from diving into a new business venture headfirst. After years as an investment banker and Six Sigma consultant, Erin left corporate America. She and her husband Tony drew down every last penny of their home equity line one week before the bank froze it, and they invested it to bring health and vibrancy to Menlo Park. Erin opened her first studio in March 2009 as a franchisee of The Dailey Method. Although she loved many aspects of the business, there was something missing. She wanted to offer a more holistic health and wellness expertise to her client base. She wanted the freedom to innovate, evolve and to continuously inspire her community to do the same. With the help of local branding firm Personify, Alkalign was born in April 2015. 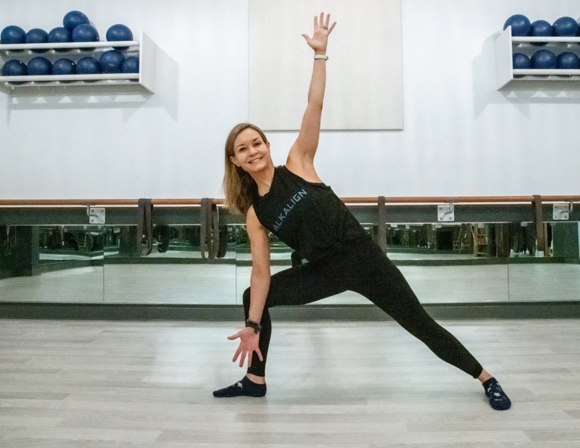 Alkalign is a boutique functional fitness studio that delivers high quality, effective and fun group classes that are different than anything else in the market. In addition to strength and cardio formats, Alkalign offers rolling classes to improve mobility as well as a holistic nutrition program, all in a supportive community environment. Erin’s mission has always been to help people feel better, and she does this by teaching people how to move better along with how to tune in and connect with both themselves and others. She’s deeply passionate about ensuring that the benefits of Alkalign are both immediate and long term. Alkalign is now franchising and has locations in Los Altos, Irvine, and Grand Rapids, MI with more opening nationwide in 2019.